We are a family of artists and designers which stretches over five generations. My great grandfather was a wealthy businessman from Manchester who moved to Glasgow. He painted small landscapes. Edward Arthur, usually known as E.A.Walton, was one of the leading painters of the group known as The Glasgow Boys, The sisters Hannah, Constance & Helen Walton were decorative artists and watercolourists. They feature in the book The Glasgow Girls. My grandfather George Walton worked with Charles Rennie Mackintosh on the famous tea rooms for Miss Cranston. He was a key figure in the Arts & Crafts movement. There is an archive of George Walton’s work at the Victoria & Albert Museum as well as many examples of his work. Edward Walton , my father inherited the creative talent and as a young man was a fine painter and draughtsman. His interests took him into work in film and broadcasting but he continued making self portraits often of great wit. Rachel Aste, my mother, studied fine art with Anthony Betts at Reading University in the 1930s but only developed her work as a printer and designer following the seperation from my father. I grew up with the smell of printing ink and parafin in a Victorian house in Oxford. Her workroom being multi-purpose, used as sitting room and bedroom. Her work table in the bay window covered in lino cutting tools, papers and card, geraniums and fine gold dust she used to add glitter to her cottage industry of Christmas cards which she sold in Libertys in Regent St London and Heal’s both outlets of progressive design in the 50s & 60s. I love the process of printing.Her first press being a large Albion looking like something Caxton would have used. I sit as I write at the same work table still with traces of gold in the cracks of the old wood and my initials scatched in the surface when a bored child. Hugo Powell works in the tradition of direct carving. His early sculpture was for churches . He studied with Eric Gill and designed and made in ceramic a listing of all the medallists for the 1948 Olympic Games at Wembley. My sister Joanna Walton has worked in costume production and design in theatre and film in Canada. My other sister Hannah Walton is a landscape architect with Hampshire County Council. My son Jack Walton works in TV as a director and cameraman. We are to collaborate on an animation project using my drawings. Ruth Walton, my daughter is a designer illustrator. 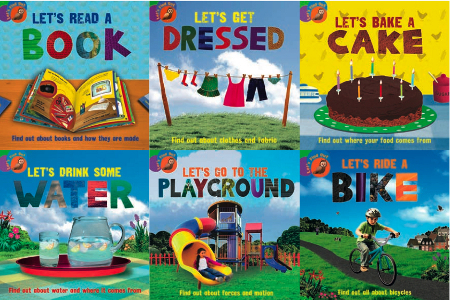 Her series of six books “Lets Find Out” are a wonderful inventive continuation of the family tradition. The collaged illustrations and typography designed to stimulate the imaginations and inform the minds of primary school children. The tradition continues. “Lets Ride a Bike” nominated for SLA award 2011. 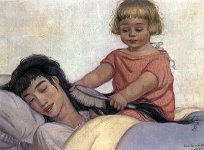 Cecile Walton, 1891-1956, daughter of EAWalton, painter, illustrator.